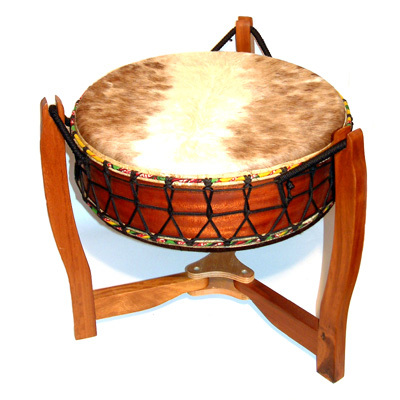 A double headed Gathering or Pow Wow drum from West Africa, with cow skin heads and rope tensioners. It is supplied with a wooden stand, but it is great fun to have three people holding it and three people playing it, so everyone feels it's amazing enormous resonant sound. It can also be hung vertically by one of the handles and played "taiko" style. It's true potential comes out whem played with felt headed beaters or even by hand. A very versatile drum! Diameter: 63 cm, Depth: 20cm, Stand Height: 64 cm.